The state of Punjab had always enjoyed a pre-eminent position in the field of Sports. To retain/improve the pristine glory and the pre-eminent position in realm of sports, an independent Department of Sports came into existence in the year 1975. Under the able guidance of the Department of Sports Punjab, many athletes of Punjab had given a par excellence performance and achieved exceptional positions in International sports arena, flying Sikh Milkha Singh, Olympian and Arjuna Awardee S. Surjit Singh, Olympian Prithpal Singh, Olympian Jarnail Singh, Arjuna Awardee Prem Chand Dogra and Padam Shree Pargat Singh are the few examples. Punjab had produced many stars of an International repute in all the disciplines recognised in India. In the early nineties, a downward trend in the standard of sports in different disciplines created a cause of anxiety. Accordingly in the year 1993 a re-organisation of the sports set up was done by merging the Sports Wing of Khed Parishad, Sports Wings of Education Department into the Directorate of Sports to give a uniform direction to sports in the State of Punjab. At present, Punjab is only state which is having maximum numbers of Astro Turf hockey fields and Synthetic Tracks and Ultra Modern Sports infrastructure in the Country. 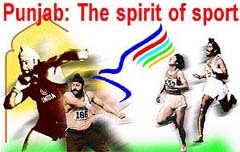 The Punjab Sports Department has been also doing exceptionally well in handling the sports activities in the state which speaks of the fact that Punjab established its supremacy by winning the overall Raja Bhalindra Singh Trophy in 31st National Games held in Punjab in the year 2001 by bagging 163 medals. Punjab got 2nd Position in 32nd National Games held at Hyderabad in the year 2002 by winning 146 medals (54 Gold, 37 Silver and 55 Bronze). The performance of Punjab State in the different National Games as well as National Championships held so far speaks of the efforts put in by the Punjab Sports Department in the development and promotion of sports in the state. MEDAL TALLY OF PUNJAB STATE IN VARIOUS NATIONAL GAMES. To implement the sports policy and procedure. To supervise staff facilities, equipment and budget for the various programmes with the promotion and development of sports in the state. To develop and organise staff capable of fulfilling the goals and objectives of the new policy/programmes. To evolve strategies which may lead to personal improvement of the participants in various sports activities. To conduct a continuing evaluation process of the new sports policy to promote maximum effectiveness of operations. To respond to immediate changing programmes. To assure a programme which may lead to appropriate resource allocation among all units and sports activities to achieve maximum results. To provide expertise and conduct of various games at block level, district level and the state level. To develop a planned programme for all sports including scheduled events for summers as well as winter seasons. To be responsible for providing coaching and competition preferably in consultation with the autonomous sports bodies and associations for all the three mother disciplines viz. athletics, swimming and gymnastics. To provide pensions to eminent sports personnel. Maharaja Ranjit Singh Award carrying a cash award of Rs. 1.00 lacs, a Scroll and a statue of Maharaja Ranjit Singh shall be presented to 15 distinguished sportspersons of the State every year, who represent Punjab in the national championships. The awardees shall be selected from those who participate in Olympic and other recognised international sports competitions in all Olympic disciplines, including Cricket, Circle Kabaddi and Handicapped Games. Separate rules would be framed to select player for the award in the game of Circle Kabaddi and Physically Handicapped Games. 10 Cricket Match Punjab player participation in Test/One day International matches (Senior) will get 10 points each year. Maharaja Ranjit Singh, the greatest son of Punjab, continues to represent qualities that also go onto the making of a sportsperson and a champion. Ahead of this time in many respects he had the rare distinction of being the only ruler in that by gone era who did not act arbitrarily and did not execute a single citizen of the state in peace time. Such a man indeed possessed the qualities that called for not only exceptional leadership in those turbulent times but also had the heart which could accommodate often conflicting ideas and interests. When we look at the times he lived in we can’t fail to notice that during his reign there was not even a single instance of communal rioting, inequality among the citizens and disrespect to any shrine or place of worship. In short as a ruler, he represented the highest virtues cherished by the noblest of people. History records the multifaceted personality of Maharaja Ranjit Singh and love for sports of his times was fairly predominant. However, unlike his contemporaries, this love was neither unbridled nor without respect for certain laws of nature. Thus, when he once caught a tiger cub during hunting he could not bear the desperate cry of the mother tigress at night and commanded the cub to be freed in the nearby forest. He was a horse rider par excellence and his prowess can be judged by the number of times his personal courage and ability to ride in hostile terrains and indifferent circumstances led to victory of forces that he led. And, yet, he remained a romantic at heart, a ruler who had the imagination of ordering 102 gun salutes to the rising of the moon when the monsoon arrives! Truly he personified the virtues that any son or daughter of Punjab years for. Maharaja Ranjit Singh award therefore ,are not only a tribute to the great son of this land of the five rivers but also recognition that the recipients possess in maple measure some of the virtues that went into the making of maharaja ranjit Singh. These awards are now being bestowed on sportspersons for the year between 1997 and 2004.state recognition of excellence in sports has been recognized as an important aspect of its duty towards the youth, for, it helps in crating an atmosphere that is conductive to channel sing the energy of youth towards creative and constructive efforts. Punjab Government has also infused greater vigor in making Punjab the lead state in the country’s march towards sporting glory. Punjab Government has made its desire, to make Punjab lead the charge towards an Olympic gold in the near future, clear in its policies, and the determination with which they are being implemented and pursued give sample hope to the sports lovers. Even more significantly, Punjab Government has not only revived the practice of honoring the sportspersons with Maharaja Ranjit Singh Award but has also infused new life in sporting activity with its renewed interest in its promotion at all levels. The award is given to those sportspersons of the Punjab who have represented the nation in Olympics, World Cup; One Day Internationals/Test Matches in Cricket and those who attain medal winning positions in Asian and/or Commonwealth Games. Originally this award carried a paltry sum of Rs.21,000 only ,a scroll of honor, a certificate ,a momento bearing the image of Maharaja Ranjit Singh astride a horse in his warrior dress ,a blazer and a color. However, the cash award has now been enhanced to Rs. One lakh. it is a well deserved recognition of the blood and sweat that has gone into the achievements of a sportsperson though it is recognized that their contribution to society can’t really be measured in terms of money. The state of Punjab is doing its duty towards the youth of the state. it is now for the youth of the state .it is now for the youth to respond with performance in the competitive arena that brings honor to Punjab and glory to the country. As far as the sports department and the government of Punjab are concerned, no effort will be spared in extending support to the state to achieve excellence in their chosen fields. More honors shall be bestowed upon those, who earn laurels at the international level and make India take its proud place among the comity of nations.